Place to know about all IT System, Motherboard information, Computer hardware parts Technical Specifications guide. The whole computer is built up around a motherboard, and it is the most important component in the PC. 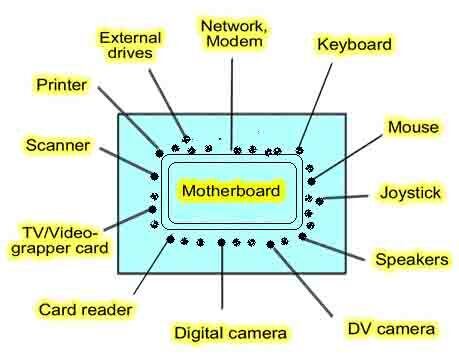 The motherboard is a large printed circuit board, which has lots of chips, connectors and other electronics mounted on it. Computer nerds simply call it a motherboard. Inside the PC, data is constantly being exchanged between or via the various devices shown below in figure. Most of the data exchange takes place on the motherboard itself, where all the components are connected to each other. Physically, the motherboard is really just a big plastic sheet i.e. PCB (printed circuit board) which is full of electrical conductors generally copper. The conductors (also called tracks) run across and down, and in several layers, in order to connect all the individual components, and transfer data between them. The motherboard is mounted in the PC box using small plastic brackets and screws. The cabinet and the motherboard are made to suit each other, so there are holes in the metal for the connectors mounted on the board. Finally, the motherboard has to be connected to the PC’s power supply installed in the cabinet. This is done using a standard connector. 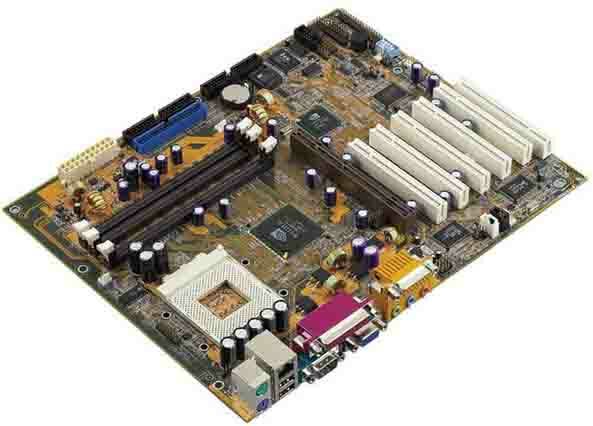 Following is the picture of a standard motherboard. There are various types of components mounted on the motherboard, which one need to know about and identify these before buying the motherboard. ROM chips, which store the BIOS and other programs. CMOS storage battery, which contains user-defined data used by the setup program. The chipset, which normally consists of two, so-called controllers, which incorporate a number of very essential functions. One will also find diffrent sockets on a motherboard. These sockets are simply a type of holders are also termed as slots, which have been soldered to the motherboard most of the times. The sockets are built to exactly match a card or a chip. CPU socket is open for the CPU (processor) to be inserted in it. There are some other open sockets i.e. 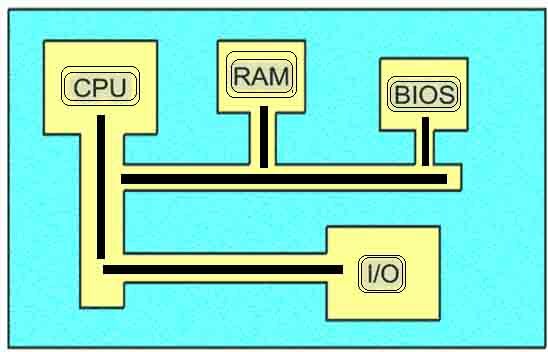 slots which are used for RAM and PCI interface cards. The idea of a socket is, that you can install a component directly on the motherboard without needing special tools. The component has to be pushed carefully and firmly into the socket, and will then hopefully stay there. Ports for the keyboard and mouse. Serial ports, the parallel port, and USB ports. The big connector which supplies the motherboard with power from the power supply. Other connectors for the diskette drive, hard disk, CD-ROM drive, etc. So-called jumpers, which are used on some motherboards to configure voltage and various operating speeds, etc. A number of pins used to connect the reset button, LED for hard disk activity, built-in speaker, etc. Most of the motherboards on the market are produced in Taiwan or China, Taiwan is said the leader in the area of motherboards. The first issue to work out is, which CPU you want to use. For example, if you want to use an Intel CPU or processor, there is one line of motherboards you can choose between which support Intel CPU. If you choose an AMD CPU, there is another line of motherboards which support AMD CPU. And the difference lies in which chipset is being used in the motherboard, so you need to choose the motherboard very carefully for which processor you want to buy.